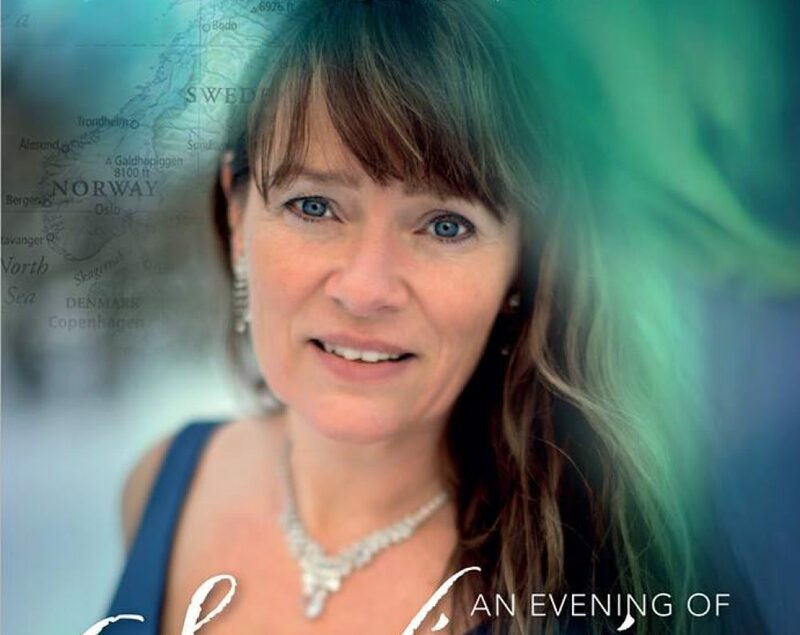 The repertoire of this evening will be classical Scandinavian music, featuring songs by Edvard Grieg, Jean Sibelius, Hugo Alfven, Gösta Nyström, Gunnar de Fremurie as well as Three Fantasies for piano by Wilhelm Stenhammar. 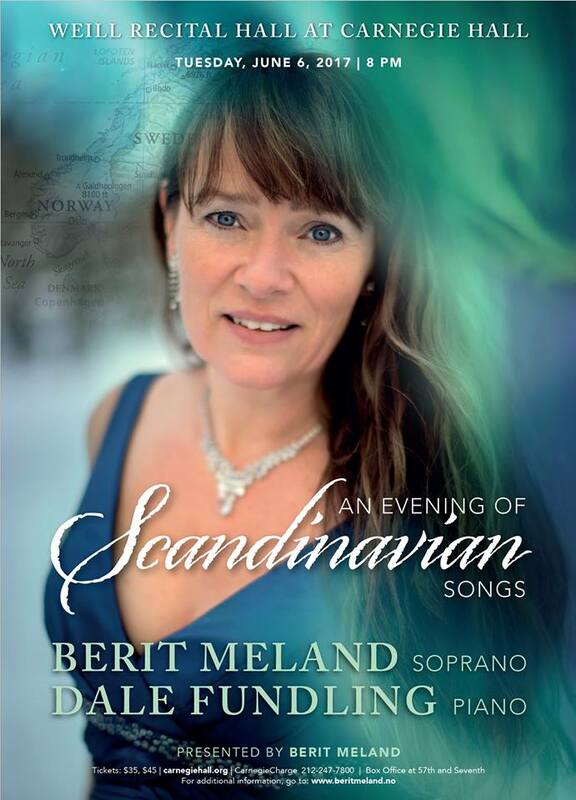 ”This music, in a way reflects the Nordic nature: the sun, the sea, the earth, the sky, the flowers, the birds and also the range of emotions witch follows the changing of seasons during the year, and the emotions that follows love and devotion between people.”, says Ms. Meland. 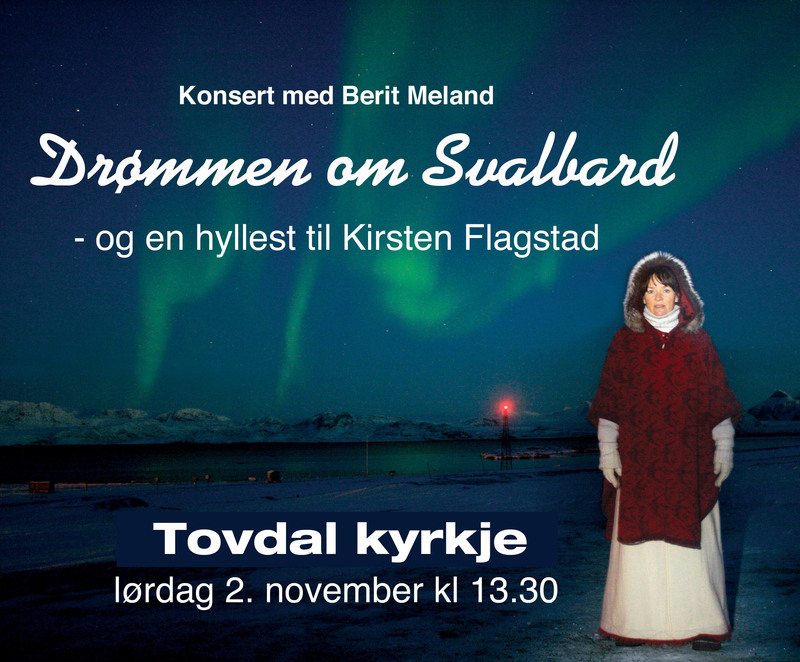 Inspired also by the famous Norwegian soprano Kirsten Flagstad, Ms. Meland has selected songs into the repertoire, found in Ms. Flagstad’s concert programs from Carnegie Hall. The concert ”An Evening of Scandinavian Songs” will enter the stage of Weill Recital Hall at Carnegie Hall June6th 2017 8pm. Ms. Meland lives outside Oslo in Norway, but her roots comes from the very north of Norway, above the arctic circle. She grew up singing in choirs, dancing and acting. In her twenties she became a nurse, but still continued to sing. In 2005, she began intensive voice studies. The dream of a solo career could no longer be held back and became her goal – with full focus on classical music and opera. She started private studies with opera-singer Elizabeth Norberg-Schulz in Rome, and continued at the Stockholm Operastudio. 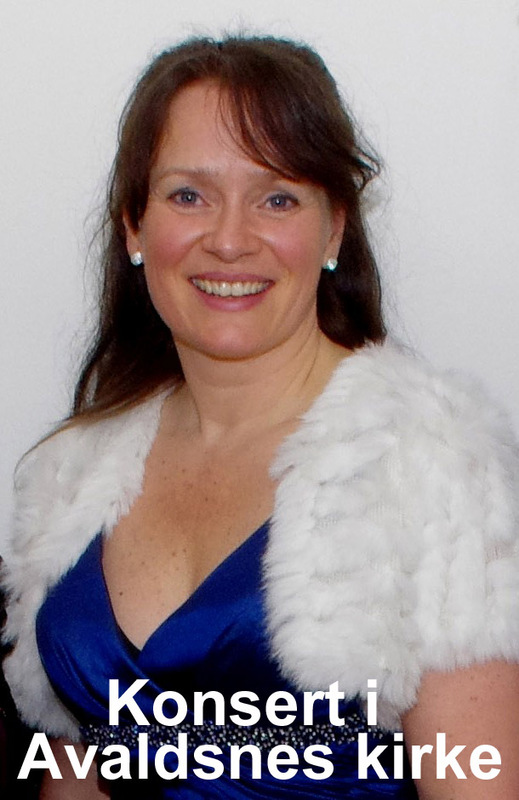 Since 2012, Dale Fundling has been Ms. Meland´s singing teacher, and today she is working as a freelance professional singer. She has put on stages several concerts and performances, and she is being engaged as a solo concert singer. Mr. Fundling is an active chamber musician, accompanist, and also a highly respected singing teacher. This evening June 6th in Weill Recital Hall, Mr. Fundling will be accompaning Ms. Meland, and we will also hear him play Three Fantasies op.11 by Wilhelm Stenhammar. Born in Fort Worth, Texas, Mr. Fundling studied piano with contemporary music specialist Jo Boatright and famous Mozart interpreter Lili Kraus at the Texas Christian University. Having graduated with highest honours, he realized his strongest interest was the human voice and he decided to dedicate his career to working with singers. Mr. Fundling has collaborated with the Fort Worth Opera, the opera houses of San Fransisco and Stuttgart as well as the Accademia Verdiana Carlo Bergonzi in Busseto, Italy. He has worked for more than twenty years with the Mozarteum in Salzburg. Mr. Fundling is a teacher of many eminent singers on the world stage, such as world famous tenor Piotr Beczala and mezzo-soprano Elina Garanca. 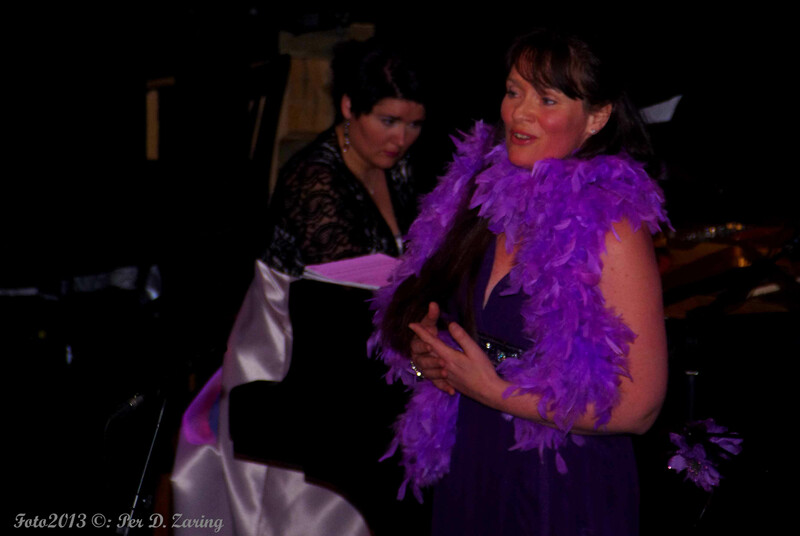 ”I am happy to count Ms. Meland amoungst the wonderful singers that I work with, and I look forward to making music with her on the stages of New York and other great cities. Her love for the music is entirely evident as soon as she begins to sing.” says Mr. Fundling. Dennne gang er det sopran Berit Meland og pianist Monica Tomescu-Rohde som setter oss i feststemning med klassisk musikk og opera. Berit Meland arbeider freelans som sanger. Bosatt på Hurum, og har sin utdannelse fra København, også videre studier med Elizabeth Norberg-Schulz i Roma og ved Stockholm Operastudio. Monica Tomescu-Rohde er utøvende konsertpianist, og har sin klaverutdanning fra konsertvatoriet i Bukuresti, Tromsø og Oslo. Arier og duetter fra operaens verden; romanser, salmer og oratorium. Alle stykkene blir akkompagnert på piano og orgel. Det blir musikk fra den tidlige operaens historie – og fra romantikken. Musikk av komponistene; Mascagni, Tosti, Bellini og Rossini, og selveste Tsjajkovskij – med «Lenski`s arie fra Eugene Onegin«, «Det blir roser fra Tyrol» og ”Cherryduetten”. Konserten er under kirketak. Det gir oss en rik kilde å øse av i repertoar. Det blir salmer og oratorium. Fra det sakrale operarepertoaret møter vi prestinnen Norma i ”Casta Diva”, og intermezzo Ave Maria. Ingen konsert uten vår egen Edvard Grieg; «Ved Rondane» og «Jeg elsker dig” for å nevne to. Olaf Storø stiller ut litografi i kirkerommet. Billedkunstneren Storø har en historie og et levd liv på Karmøy i 15 år. Utstilling også i Bjørgene Grendahus med flere bilder.